Theme Junkie has everything you need to give your site a new look. There's a reason people of all skill levels love WordPress. The platform is malleable and easy to customise – you just need to have the right tools to make your site look good. Give your site the professional look it deserves with a lifetime subscription to Theme Junkie. You can get unlimited access on sale for just $24.99 (approx £19). When you're building your website, you won't find a better platform for it than WordPress. No matter what you want to do with your site, you can make it happen with the help of themes designed by the experts at Theme Junkie. Grab a lifetime subscription and You'll find more than 50 beautifully crafted and totally responsive WordPress themes – with more being added all the time. Get highly optimised themes that can be customised to your heart's content. 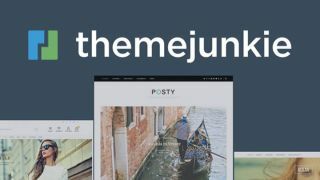 You can get a lifetime subscription to Theme Junkie’s stash of incredible WordPress themes on sale for only $24.99 (approx £19). That's a savings of 74% off for a lifetime of access to themes that will make your website stand out, so grab this deal today!